Hello Everyone! I have finally surfaced after two months away from our weekly fun. Life seemed to get busy and I had to step away from my craft table for a bit. But I am back and ideas and projects are starting to come to the surface again. My creative mojo is returning. 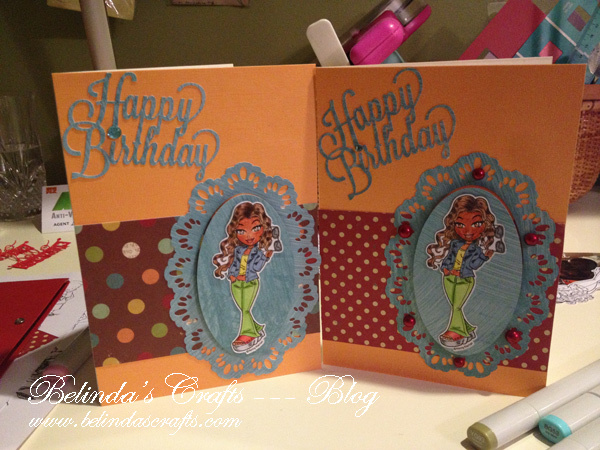 On the left you can see two birthday cards I just made for some upcoming birthdays. My sweet husband bought me a Silhouette for my birthday and up on the top left you will see the glitter that came with it. You will also see my first cuts up there. One is of the words “Hello Summer” and then I learned how to use the print to cut feature to cut out some of my digis. More on my adventures with my new Silhouette. I have only had it a few days but I am having a blast. 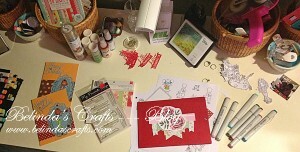 In the center of my desk you can see my teacher gift I am working on. It is a file folder converted to a stationary holder. 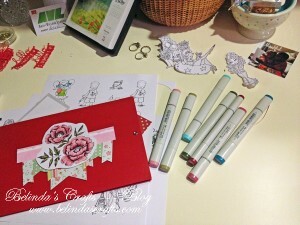 I stamped and colored up the flower and I made the banner with my dies. Inside I am going to make monogrammed stationary for her. My gift for my son’s teacher. Under the folder are some images I am coloring up for an upcoming contest entry. On the top right I printed out a photo using one of my recent favorite iphone app called Beautiful Mess where I can put cute doodles on my photos and when I print them you can see them. So cute especially for Project Life. Some cards I made for upcoming birthdays. Well I have been away too long so I am off to go soak up your creativeness. Previous PostCreative Mojo….where are you? Hi Belinda. Thank you for stopping by today. It is great to meet you. As a retired teacher, I know your son’s teacher will love the gift you are making. It is beautiful. I too read the Artist’s Way. It took me awhile to work my way through it (starting and stopping several times) but I finally finished it when I joined an online group and we worked our way through together. Thank you for the visit and the kind words. I might have to try an online group because I need a little more support to see it through. Sandy that is so funny! They look so much prettier than the old white ones we typically use. I can’t wait to play. I will post some seeing that I at least you understand my excitement! I’m ordering a Silhouette tomorrow! We’ll have to start a support group. thanks for visiting my place and welcoming me to yours. Oh definitely, I am already bookmarking places to get free images. So let’s keep in touch. loving the pieces you are working on and whe you get your envelope maker there will be no stopping you. Happy Returns! The silhouette is all about jumping in and getting going, I think those who hesitate and worry about the ‘tech’ thing (like I would) tend to find it harder. So glad you’ve found some times to enjoy some crafting again, good for the old brain box huh!! Girl you sure do make your rounds. Thanks as always for the encouragement and visit. Love your desk, well organized and full of goodies!!! Your cards are very cool! And your desk is definitely busy! Thanks for visiting and happy WOYWW!